Fridge Filterz FFGE-391-2 cyst filter (Standard 42 & 53) 2 Pack replacement water filter is designed to fit selected GE* & Hotpoint* refrigerators. This premium water filter is designed to remove fine sediment, Chlorine Taste and Odour as well as contaminants and heavy metals including Lead, Mercury, Lindane, 2-4-D, atrazine and benzene, to name a few, that may be present in your drinking water. This refrigerator filter replaces: GE* MWF, MWFA, GWF, GWF01, GWF06, GWFA, Hotpoint HWF, HWFA. The FFGE-391-2 is tested to meet NSF/ANSI Standard 42 & 53, Particulate Class I, to ensure that you are getting a SAFE, quality product. Fridge Filterz are manufactured to the highest quality standard, providing you and your family with clean, odour free ice and water without removing beneficial minerals and fluoride that may be present in your drinking water. All of our fridge filters are made with environmentally friendly (green) carbon. *GE is a registered trademark of General Electric Company. Fridge Filterz FFWP-902-2 (Standard 42) 2 Pack replacement refrigerator water filter is designed to fit selected Whirlpool*, KitchenAid* & Kenmore* Front Grille 1/4 turn style refrigerators. This refrigerator filter replaces: Whirlpool* Filter 4396508, 4392857, 4396163, 4396547 & 4396919 - KitchenAid* Filter 4396163, 4396547 & 8212491 - Kenmore* Filter 46-9010, 46-9902, 46-9908, 9902 & 9908. The FFWP-902-2 is tested to meet NSF/ANSI Standard 42, (taste and odour) Particulate Class I. It is designed to remove sediment, small particles and the Chlorine Taste and Odour that may be present in your drinking water. Fridge Filterz are manufactured to the highest quality standard, providing you and your family with clean, fresh tasting, odour free ice and water without removing beneficial minerals and fluoride that may be present in your drinking water. All of our fridge filters are made with environmentally friendly (green) carbon. Fridge Filterz FFWP-309-2 cyst filter (Standard 42 & 53) 2 Pack replacement water filter is designed to fit selected Whirlpool*, KitchenAid* & Kenmore* push button bottom mount refrigerator models. This premium water filter is designed to remove fine sediment, Chlorine Taste and Odour as well as contaminants and heavy metals including Lead, Mercury, Lindane, 2-4-D, atrazine and benzene, to name a few, that may be present in your drinking water. This refrigerator filter replaces: Whirlpool* Filter 4396710, 4396711, KitchenAid* Filter 4396710, 4396711 - Kenmore* Filter 46-9030, 9030, 9020. The FFWP-309-2 is tested to meet NSF/ANSI Standard 42 & 53, Particulate Class I, to ensure that you are getting a SAFE, quality product. 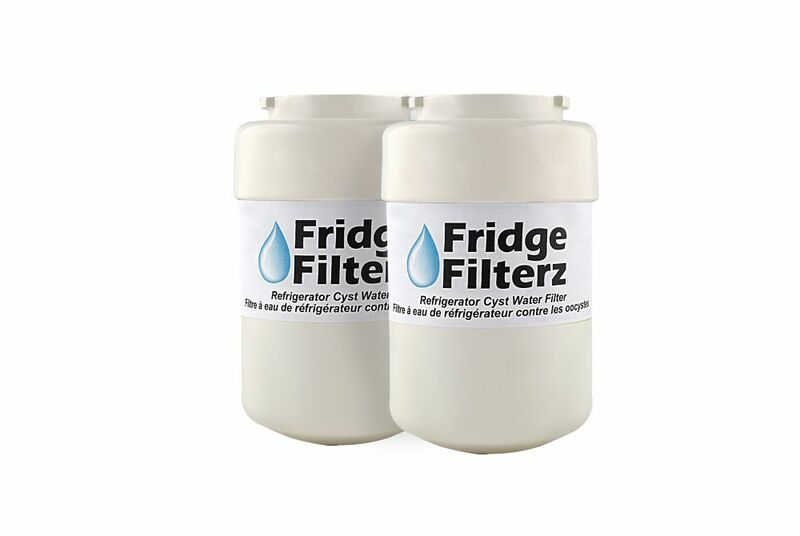 Fridge Filterz are manufactured to the highest quality standard, providing you and your family with clean, fresh tasting, odour free ice and water without removing beneficial minerals and fluoride that may be present in your drinking water. MWF/MWFP Replacement Water & Ice Filter for GE Refrigerator (2-Pack) Fridge Filterz FFGE-391-2 cyst filter (Standard 42 & 53) 2 Pack replacement water filter is designed to fit selected GE* & Hotpoint* refrigerators. This premium water filter is designed to remove fine sediment, Chlorine Taste and Odour as well as contaminants and heavy metals including Lead, Mercury, Lindane, 2-4-D, atrazine and benzene, to name a few, that may be present in your drinking water. This refrigerator filter replaces: GE* MWF, MWFA, GWF, GWF01, GWF06, GWFA, Hotpoint HWF, HWFA. The FFGE-391-2 is tested to meet NSF/ANSI Standard 42 & 53, Particulate Class I, to ensure that you are getting a SAFE, quality product. Fridge Filterz are manufactured to the highest quality standard, providing you and your family with clean, odour free ice and water without removing beneficial minerals and fluoride that may be present in your drinking water. All of our fridge filters are made with environmentally friendly (green) carbon. *GE is a registered trademark of General Electric Company. MWF/MWFP Replacement Water & Ice Filter for GE Refrigerator (2-Pack) is rated 4.0 out of 5 by 5. Rated 5 out of 5 by SMcD from Perfect Decided to buy these from Home Depot instead of from the fridge manufacturer. Much cheaper and a perfect fit. Rated 1 out of 5 by Unhappy Customer from Not a good alternative This was my first time buying this product to replace the filter in my fridge, since it was less expensive than the other replacement for the GE fridge filter GE MWF. Unfortunately, when I went to install this filter I could see right away that this filter wasn't an exact match, and had a different configuration for the top where it gets inserted & locked in place (it wasn't a complete ring). I found that this difference made the filter extremely difficult to install and I struggled with it for more than half an hour to get it locked in place. But afterwards the water would not dispense correctly, so I had to take the new filter out and reinstall...which took another 30+ minute fight before getting it in & the water to dispense freely. These filters are not worth the $5 dollars saved compared to their alternative, so next time I'll spend the few extra dollars to get the other filter replacement. Rated 5 out of 5 by Aggie from Satisfied, good price, will buy again Most cost effective from what I can find online. Suites my fridge fine.